After a successful Kickstarter campaign raised over $225,000, a group called Organic Transit is starting to produce a hybrid vehicle that’s designed to bridge the gap between a bicycle and a full-sized vehicle. With a design opposite from a traditional tricycle, the ELF is small enough to fit in a standard bicycle lane on the road while still offering storage for several bags of groceries or work-related items. 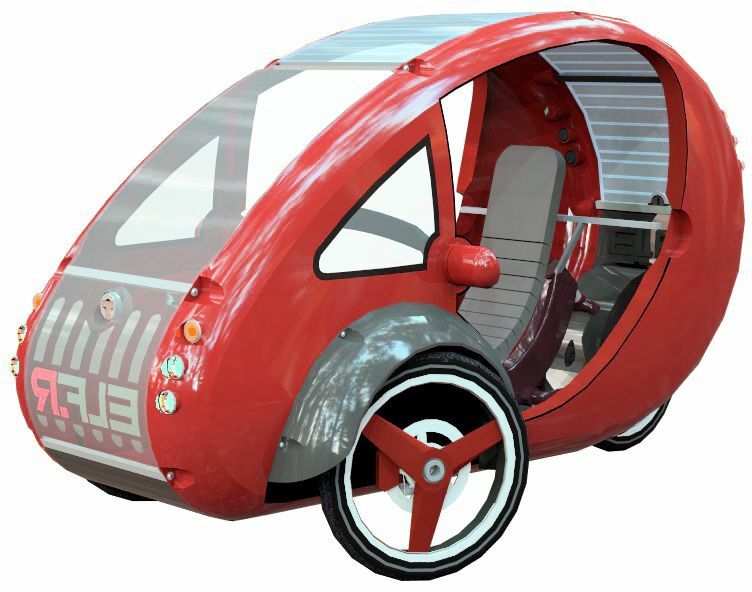 While the ELF can be powered by pedaling, the vehicle comes with a 480-watt Lithum battery pack that can be charged using the solar panels on top of the vehicle or by plugging the car to a standard outlet. Conceptually, the ELF could allow a commuter to use the battery power to get to work and avoid arriving covered in sweat. While the battery could be recharged at work, the vehicle could simply be pedaled home in order to skip a visit to the gym for cardio. The ELF can travel up to 30 miles on a single battery charge, but a second battery pack can be added to increase the range. The 60-watt solar panel can charge the battery to half strength over an eight-hour period, however the battery can be fully charged in two hours by plugging in the ELF. 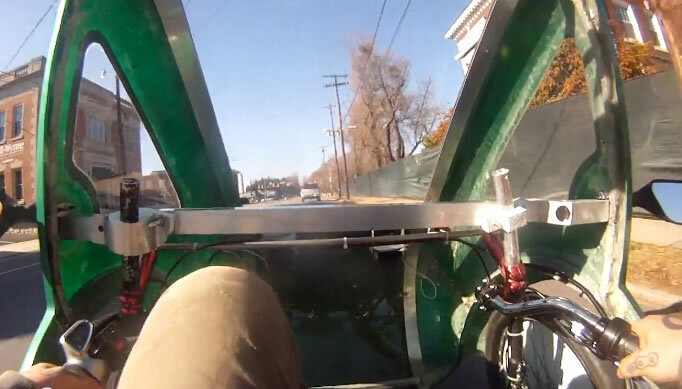 The ELF has a top speed of 20 mph when utilizing electric power, but the user can use the pedals to increase the overall speed of the hybrid vehicle. 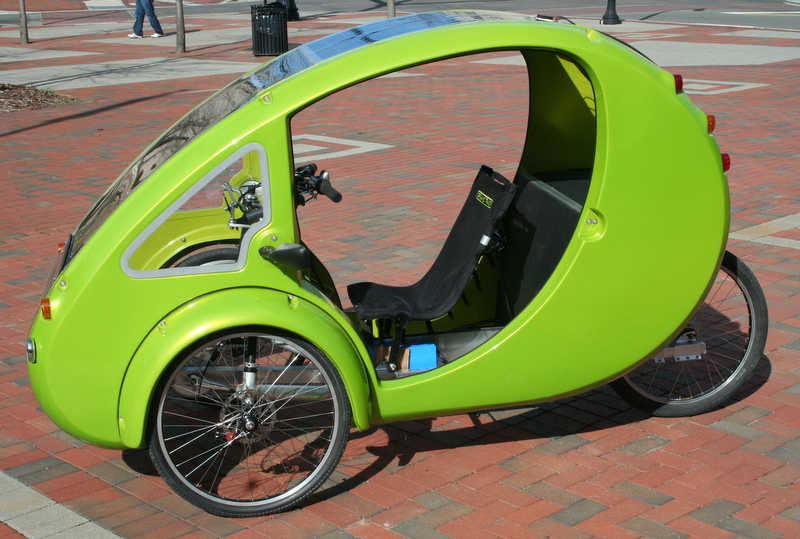 According to the Kickstarter page, the ELF can travel 1,800 miles on the same energy produced from a gallon of gas. Interestingly, the ELF is classified as a bicycle in all fifty states according to current federal guidelines. That’s specifically why the vehicle is limited to 20 mph on electric battery power. Regarding the core design, the ELF is built out of a lightweight aluminum frame and sits on 26-inch wheels. For safety on the road, the ELF has LED headlights and tail lights as well as turn signals and disc brakes. Organic Transit has also included side mirrors on the outside and an adjustable seat. The first batch of models will only come with a single seat, but the owner could hypotehtically attach a jump seat in the back since the ELF can handle up to 350 pounds. The entire vehicle only weighs 92 pounds, but that number can quickly rise based off modifications and additional battery packs. While the vehicle is waterproof, there are no doors on either side of the vehicle. For commuters living in climates with frequent inclement weather, Organic Transit has designs that attach clear panels to both sides of the vehicle. These panels have the added bonus of keeping out insects and road debris. While the base unit is priced at $4,000 to start, upgrades such as extra battery packs, more efficient solar panels and an improved transmission can send the price as high as $6,000. Organic Transit is currently working to fulfill the orders for Kickstarter backers, but the company is also taking orders through the official site. According to the current production schedule, interested consumers that order now could be driving an ELF by summer 2013.